Microsoft’s showcasing the power of universal apps, machine learning, and the Microsoft ecosystem with Story Remix, an intriguing new app that helps you create personalized videos quickly and easily. That’s cool—and that flexibility extends to highlighting a particular person in your video. If you’re creating a video from imagery that includes several different people, Story Remix will identify them all and let you choose a “star.” Changing the star will also cause the video to remix itself on the fly. Nifty! If you’re not digging the videos Story Remix creates, you have a couple of different options. Simply clicking the Remix button again reorganizes the video with a new vibe, new pictures, and new music, or you can click an Edit Story button to take more manual control. The main Story Remix interface. Those manual editing controls seem reasonably potent and include a few particularly helpful features. Not only can you rearrange and edit the flow of images used in the video—including panning and zooming on the fly—but you can also add text to a scene or pull in 3D objects from Remix 3D. Since Story Remix relies on Microsoft’s machine smarts, you can configure that text to follow a person as she moves around a video, keeping the words in the same position in relation to her throughout. The Remix 3D integration’s more interesting, and the key to Story Remix’s mixed-reality chops. Once you find a 3D image you like, you can add it to the video manually. Even better, the app supports animations found in Remix 3D. In one example, a 3D tyrannosaurus rex chased a woman in front of a volcano, while another demo added a fire animation to a soccer ball in a clip from a kids’ game. While we haven’t tried it in real life, adding those effects appeared fast and simple in the demonstrations. 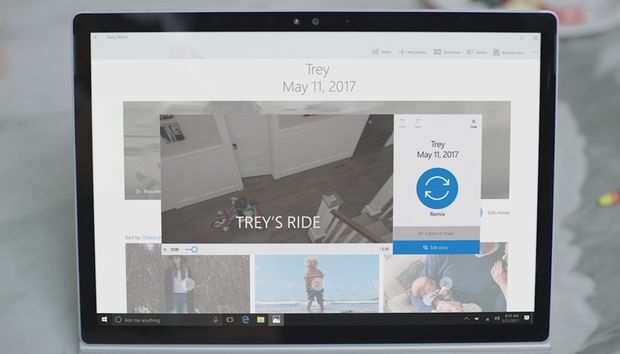 Story Remix is also rife with features Microsoft’s been pushing recently, including touch support, collaborative features, seamless transfer of imagery between devices, and the machine-learning functions the entire app revolves around. All in all, Microsoft’s Story Remix app looks impressive, and it’ll work on Windows 10, Android, and iOS when it debuts. Speaking of which, Microsoft didn’t announce a release date for the app, but it was introduced as part of the Windows 10 Fall Creators Update unveiling. You can see Story Remix in action here.